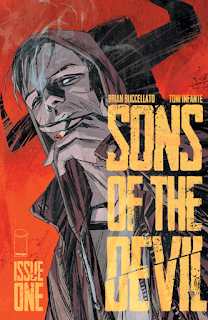 The Fellowship was fortunate enough to obtain a copy of SONS OF THE DEVIL #1 from Image Comics. Brian Buccellato writes, with art by Toni Infante. Travis is a decent guy with a bad temper. He was a foster kid, and he’s got kind of a bad relationship with his foster brother Klay, who’s a birth parent investigator. When Klay stumbles across a clue about Travis’ birth father, Travis is not interested. But Klay’s murder and Travis’ community service sentence push him to contact the counselor whose name he got from Klay. This first issue does two things really well. It gives us a good feel for Travis as a character, and it gives us the feeling that something’s going on in the background. There’s a lot of focus on his anger, and I look forward to seeing where they take that thread. There are some really cool things in the art, as well, not least being the emphasis on the faces and expressions. This book does a wonderful job of building up (to what I’m not going to spoil). It’s a story that’s easy to get excited about. Grab it while you can. SONS OF THE DEVIL #1 is available now at your FLCS or at imagecomics.com.